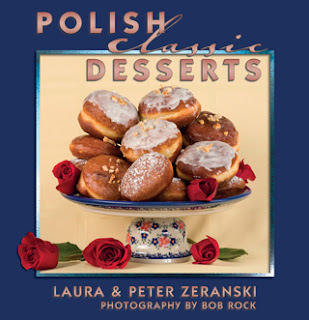 Polish Classic Cooking: I love you...will you marrow me? I love you...will you marrow me? Witamy! I have this childhood memory of standing in the kitchen, at this huge, white, chipped stove that was taller than I and being handed a little square of fresh rye bread on which rested this shiny brown dollop of lightly salted beef marrow. It was so amazingly delicious, there was never enough and we only got it once in a great while. I know it’s not very good for you, but once in a while we can indulge ourselves, can’t we? Didn’t Julia Child say something about butter not being bad for you as long as it is taken in moderation? For my taste, hot fresh marrow is right up there with fois gras, truffles and Russian caviar - all very expensive luxuries but absolutely worthwhile, once in a while. Only marrow is not expensive. 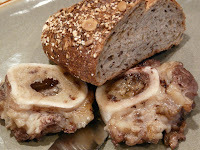 This morning I asked the butcher in our local grocery store for some marrow bones, veal or beef shanks are the best. I got two pounds of bones, cut into one-to-two inch chunks, for three bucks. Threw them in a roasting pan and popped them in the 400-degree oven for half an hour. They came out as soon as the fat of the marrow was starting melting away. You don’t get much marrow out of two pounds of bones (maybe a couple of ounces), but then you don’t need much. When I scooped it out, frankly it looked a little gross – shiny, mottled brown, fatty, but with a delicious and pronounced aroma of beef. I spread some on a piece of crusty, 9-grain bread…hit it with a little salt…closed my eyes…inhaled the aroma like a fine wine, and took a bite. Wow! Rich, smooth, beefy -- I don’t have the words to do it justice but its way up there on my top ten list.